Coast Guard Rescue Helicopter Makes Surprise Visit to Kilmurry. 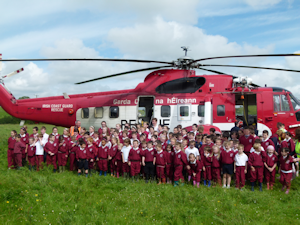 Today Monday 25th of June at 10am the Irish Coast Guard Rescue Helicopter based in Shannon made a surprise landing in Kilmurry witnessed by pupils from the local National School. The guys on board gave the pupils a first hand account of their job and how the different systems work on the rescue helicopter. Thanks to those that made it happen and helped for the event to pass off safely.